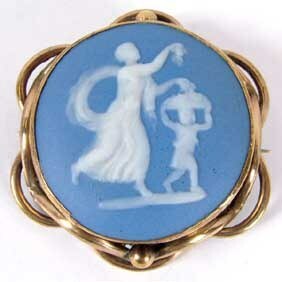 In 1774, Wedgwood wrote the following in his catalogue: "We beg leave in this place to observe that if gentlemen or ladies choose to have models of themselves, families, or friends made in wax or engraved in stones of proper size for seals, rings, lockets, or bracelets, they may have as many endurable copies of these models as they please, either in cameo or intaglio, for any of the above purposes, at a moderate expense; and this nation is at present happy in the possession of several artists of distinguished merit as engravers and modellers, who are capable of executing these fine works with great delicacy and precision. If the nobility and gentry of Great Britain should please to encourage this design, they will not only procure to themselves everlasting portraits, but have the pleasure of giving life and vigor to the arts of modeling and engraving. The art of making durable copies at a small expense will thus promote the art of making originals, and future ages may view the productions of the age of George III with the same veneration that we now gaze upon those of Alexander the Great and Augustus . 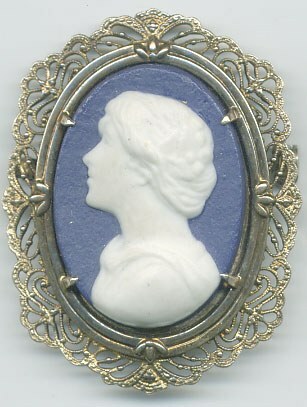 . ."
Wedgwood's first portrait medallions were made entirely in one color, using his creamware paste. The result was a cream white surface with a glaze not too brilliant, having some resemblance to salt glaze. In fact, some of these medallions have been mistaken for salt glaze. 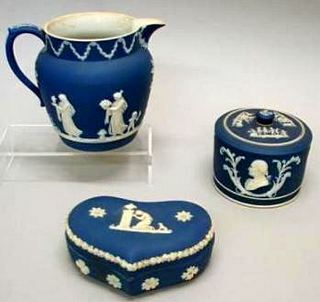 These are not the best in fineness of detail or appearance, but are interesting indications of the obstacles Wedgwood had to surmount before he achieved the excellence of his later work. After 1768 Wedgwood made portraits of black basalt. These were well modeled, but since they were all of one color they were not as effective as the later jasper medallions. With a view to heightening their effectiveness, many of the basalt medallions were given self-frames, either a molded edge or more elaborate forms like that seen in the portrait of Inigo Jones. After years of experimenting, in 1774 Josiah Wedgwood, pictured on the left on a Reverse Glass portrait by Richard Clay, announced the discovery of jasper, a hard white body, having the properties of basalt and in addition that of taking color. This made it especially suitable for cameos and portraits in relief, where the ground could be colored and the raised figure left white. In addition to light and dark blue, Wedgwood used varying shades of green, lilac, yellow, occasionally a pink, and black. Subjects from the Greek Classical world were chosen first, partly because of the revival of interest in all things classical in the latter part of the eighteenth century, and partly because of the work of James Tassie, a Scottish artist who made reproductions of ancient subjects, chiefly in glass paste, as well as modern portraits. No effort or expense was spared by Wedgwood in obtaining the finest artists and sculptors of the day. He had them travel through Europe, especially Greece and Italy, to copy and interpret subjects from mythology and portraits from antique gems in museums and private collections. He also made use of some of Tassie's models. For portraits of celebrities in the more recent past, Wedgwood had recourse to old medals, coins, intaglios, and prints, a great many of which were in the British Museum and in notable private collections like that of Sir William Hamilton. Whole sets of portraits were made in chronological order for display in cabinets. These included a series of "Heads of Kings and Queens of Asia Minor," the "Caesars and their Empresses," "Kings and Queens of England and France," and heads of popes, Greek philosophers, statesmen, orators, poets, and other celebrities of the past. Along with these Wedgwood started making what he called "Heads of Illustrious Moderns." This class of medallions stands high among 'Wedgwood's fine art productions. They have been valued and preserved not only because of the eminence of the people portrayed but also because of the illustrious artists who made the original models. 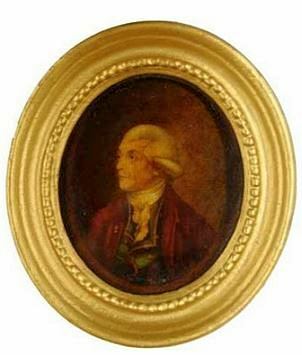 Wedgwood's first modeler of portrait medallions was Joachim Smith, who worked only for a year or two. He was then succeeded by John Flaxman, and the medallions rose at once in excellence. 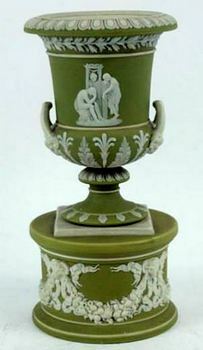 In addition to Flaxman, Wedgwood engaged William Hackwood, Isaac Gosset, John Lochee, Henry Webber, and others. It is difficult, almost impossible, to identify their respective works. Some have been identified by means of old letters and bills. In a few instances, William Hackwood engraved his name or initials on models, the most important one being that of Josiah Wedgwood himself, and the artist Pesez incorporated his name in the portrait of de Montaigne. 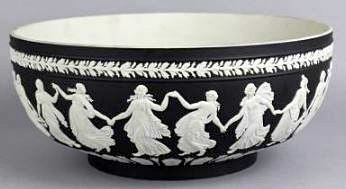 In general, however, Wedgwood did not permit his artists to sign any of their work. 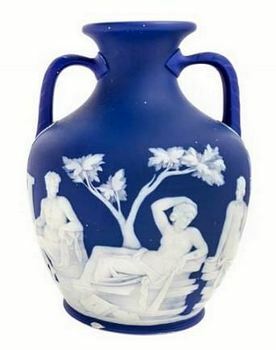 Wedgwood listed all his medallions, cameos, intaglios, and busts in his catalogs, to be sold either singly or in sets. Almost all the subjects were labeled with identifying names, either impressed on the front or impressed or scratched on the back. The lists include such distinguished names as Franklin, Washington, Pitt, Keppel, Dr. Priestley, Necker, Lafayette, Gibbon, Garrick, Voltaire, Benjamin West, Joshua Reynolds, and Mrs. Siddons. The jasper portraits became so scarce in course of time that Wedgwood himself complained that he was unable to form a complete cabinet of his own. The portrait medallions ranged in size from a half inch in diameter to ovals of seventeen inches. After firing, the finished medallion was up to one-seventh smaller than the original model, and provision had to be made for this shrinkage. In the case of many of the medallions and plaques on which the relief was of more than usual height or thickness, the backs of the flat portion had holes cut through into the white relief area, to eliminate cracking or warping during the firing and cooling process. Basalt plaques and medallions that were molded sometimes had depressions in the back where the relief was high. Self-frames were often used, or a decorative border in relief like the fleur-de-lis and anthemion motifs in the group of French portraits. Many that were not intended for framing had the edges highly polished. The backgrounds were sometimes laminated or made of layers of different shades of blue. When the edges of such examples were polished, they were usually beveled, making a very effective treatment. It is often difficult to place the period of a medallion by the mark. The age of portraits with the mark of Wedgwood & Bentley or the initials can most easily be determined since these marks were used only during the partnership of Wedgwood with Thomas Bentley from 1769 to 1780, when Bentley died. The name "Wedgwood in lower case was used from about 1780 until sometime after the death of Josiah I in 1795, mainly on portraits in basalt, but the name all in capitals was used on the first marked pieces and continued until 1891, when the word England was added to comply with tariff laws. While most medallions show a single profile, there are instances of superimposed heads and two profiles facing each other, mostly copies from the classical world. Some of Wedgwood's finest medallions show the subject full face, or three-quarter face like the portraits of Anthony and Cleopatra modeled by Hackwood, of which Wedgwood himself wrote in 1775 that he considered them "the finest things imaginable." The collecting of portrait medallions can be of infinite fascination, involving as it does a knowledge of history, mythology, and the leading figures in the realms of science, religion, and the arts. Some of the Wedgwood portraits are impossible to identify, since the subjects were obscure men and women who just had their "pictures taken," as we would say today. In order fully to appreciate and understand the Wedgwood portrait medallions, there are several things a collector should bear in mind. The main features to be observed are the texture of the body, the height of the relief, and the undercutting and rendering of details of hair and clothing. The period from the first discoveries until about 1800 is the best, when full justice was done to the fine work of the artists by the excellence of the medallions. Many of these portraits are the only remaining evidence we have of the appearance of these eighteenth-century celebrities. It is difficult to estimate the rarity of each individual portrait, but to a certain extent all of the eighteenth-century portrait medallions are rare.